AUCKLAND, New Zealand - Adaptability, quality and a clear objective - Cole Peverley says the Navy Blues hunger for more success is driving Auckland City FC on. Peverley, 29, joined the Navy Blues in the January transfer window with the OFC Champions League uppermost in mind and the former All White is having a great time in what is his second stint at Kiwitea Street. The Navy Blues downed an impressive Solomon Warriors 2-0 in the quarter-finals last Sunday, a result Peverley says proves the club remains just as strong regardless of the nationality of whoever pulls on the jersey. "We've got a big squad and any player chosen on the day is more than capable of performing a high quality job. Its a great asset to have and competition for places is intense. "The squad relies on quality and whether or not its Albert Riera in midfield or someone else, we all understand the playing system very well and its up to us to step in and do the job. 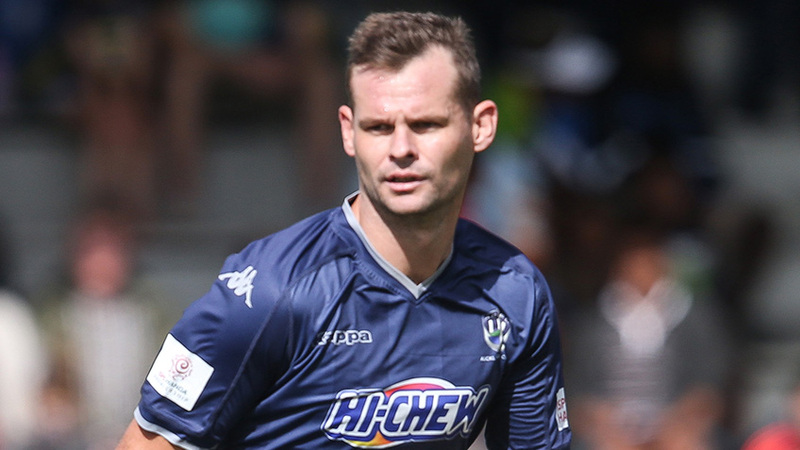 Peverley spent the bulk of his domestic career with Team Wellington and helped the club win its first ISPS Handa Premiership title in 2016 as the capital men defeated Auckland City FC 4-2 after extra time. Injury curtailed his contribution to the club's second title but now he can't wait to lock horns with a side he holds in high regard. "Its exciting to be facing my old team. I spent seven very successful years with Team Wellington and it will be exciting to go to David Farrington Park with a place in the OFC Champions League final up for grabs. "The return match at Kiwitea Street will be just as exciting. We know them very well and they know us and it will be a highly competitive game. We'll have to be at our best to get a result over the line," he said. Peverley reflected on the performance against Solomon Warriors with pride after the Navy Blues overcame a slick attacking side who threatened to break Enaut Zubikarai's shut-out record with the Spanish goalkeeper pulling off a series of jaw-dropping saves. Auckland City FC have gone an incredible 14 consecutive matches in all competitions without conceding and Peverley says Zubikarai has been incredible for the club's defensive miserly record. "I've played with a lot of top goalkeepers in my time and Zubi is probably the best of them. If Zubi doesn't win a return to professional football or end up at the Wellington Phoenix then I'll be amazed. "If Zubi stays at Auckland City FC then thats great for us because there are not many better goalkeepers around. Its good to have a keeper behind you that you can trust. "A semi-final with Team Wellington is what we wanted. We were nice and composed and the Warriors showed they are a good side with some attacking assets you've got to take care of. The game went to plan and we're happy to be in the next stage," he said. The OFC Champions League semi-final first leg is scheduled for Sunday 22 April, 2018, at David Farrington Park.